This book came to me in a most remarkable way, it has own little history as a passenger! First of all, I read about it at Kim’s blog, Reading Matters, and when I commented about it, Kim, who was about to pack her bags for Australia to see her parents, offered to bring it with her. The book duly made the journey in Kim’s suitcase, but then for various reasons, we couldn’t manage to meet up while she was here. 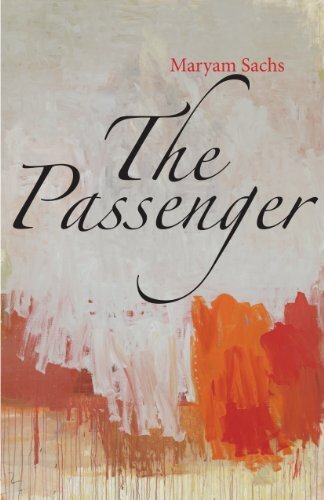 Imagine my astonishment when, after chairing a panel at the Stonnington Literary Festival, ‘Sharkell’ who often comments here on this blog, came up to introduce herself – and handed over The Passenger, passed on to her by Kim somewhere in Gippsland! Then the book made another 2500km journey because I took it in my suitcase on my recent trip chez maman et papa – and I finally read it on the plane coming back. What a well-travelled little book it is, eh? It is little: only 112 pages, but it has a bigger impact. It is the story of an immigrant now well-established in Paris, who takes a taxi home after a work trip to Greece, and finds her long-suppressed life unravelling as she makes her way through the traffic to her family. Nothing much happens, but the reader senses the enormity of her new awareness that the past travels with her, wherever she goes in life. It’s interesting to see which reflections from her past she chooses to share with him. It is a very intimate conversation – he tells her of his frustrated love for a Japanese woman and how they are separated by a bizarre Japanese taboo about not mixing blood types; but she does not tell him about how she lost the love of her life when she was just a young woman. What they share is the sense of being foreigners in Paris even though they have both lived there for many years and both know the city well. He is from Romania, and she grew up in East Germany before unification so both have left behind a life of privation and political suppression, but they carry this baggage with them. It is only this chance encounter that enables them to confront the way the past impinges on the present because the business of living in a place that they never quite belong in, doesn’t allow for navel-gazing. It is only because they are temporarily marooned together in the psychological safety of the taxi that they can allow themselves the freedom to remember and to quietly mourn their losses. This is a thoughtful, meditative book. Kim in her review wrote that although the book is sad, it left her feeling relaxed and at ease, almost as if I had plunged into a bubble-bath for a long, hot soak. I found it melancholy too, but with an insistent reminder to be mindful of others, whose outward appearance belies a rich and sometimes tragic inner life. Like Michelle de Kretser’s Questions of Travel, The Passenger has a gentle purpose, a reminder to those who host immigrants and refugees, that there is value in learning the stories that surround us every day. Do read Kim’s review, and also the launch speech of Naim Attalah, chairman of Quartet Books. It is not often that we get to hear the publisher sing the praises of his authors like this! Thanks once again to Kim and Sharon:). Source: Personal library, a gift from Kim at Reading Matters. What a well travelled little book! I am off now to read the other reviews and links before I add it to my books to read list. Hi Julie, good to hear from you! Thanks for dropping by and Happy New Year! I hope 2014 is a happy and book filled one for you Lisa! I remember reading about the journey this book took to make its way to you – rather fitting, considering its title. Great review Lisa. I’m pleased to have been part of the journey!